This video will demonstrate the general technique, design and how to for the build of the bearing. The bearing will slide on an aluminum or steel angle (or a metal round rod if you prefer) keeping the bearing in place. First, you will need an angle, easily acquired at your local hardware store. I use an aluminum angle for the ease of drilling and tapping. I will explain tapping in more detail later. Notice the imperfect cut at the end of the angle. This is ok since the z-axis will use compression to stay rigid. Cut two pieces of the aluminum angle. Depending on the method of attachment of the bearing system to the z-axis housing, the length will vary. I will be cutting them at 3.5" in length for use in the z-axis. You will then need to drill four holes into the aluminum angle. These holes need to be somewhat precisely positioned. I use a scrap piece of metal to position the holes from the inside edge of the angle. How far from the inside edge, you ask? Since a screw or bolt will need to be fastened into this hole, the hole will need to be positioned at lease half the diameter of the screw away from the inside edge. Drill four holes close to the ends of the angle to provide the most stability possible. To provide a rigid shaft for the bearings, these holes will need to be tapped. Tapped... Hum... This is one of those words that mean so many different things. Tapping a material in this case is just turning these holes into nuts, essentially! You will need a 5/16" tapping tools which includes a drill bit and tap combination. You can get this at your local hardware store as a package pretty inexpensively. I will be using the drill to tap the material, but I do not recommend you do this. Get the proper tapping tool (looks like a "T" handle) to drive the tap into the material. Finally, slide the skate bearing into the 5/16" bolt followed by screwing the 5/16" nut into the bolt to serve as a spacer. 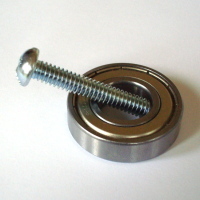 Screw the bolt-bearing-nut onto the outside of the aluminum angle. You will notice that you have just enough thread left over to fasten it into the angle. A few things come to mind with this step: Depending on the size of the round rod (if that is what you are using), the initial holes will need to be positioned differently. If you would like to increase the size of the round rod, the position of the holes and maybe the size of the angle will need to change.